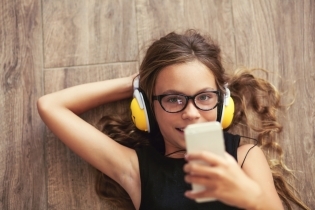 Some parents, concerned about the potential for noise-induced hearing loss, encourage their children to use volume-limiting headphones when listening to music or watching videos on smartphones, tablets, and other electronic devices. These headphones have volume controls that are purportedly set to go no higher than 85 decibels (dB)—because exposure to sounds at or above 85 dB for a prolonged period of time is widely recognized as a potential cause of hearing loss. Many manufacturers make headphones that are labeled and marketed as volume-limiting for children. Do their safety claims hold up? In December, The Wirecutter, a New York Times company that reviews gadgets and gear, analyzed several models of volume-limiting headphones for children. The company notes that it benefits financially from purchases made through the links on its site, but that it publishes “unbiased guides that clearly detail our decision-making criteria to our readers.” Noisy Planet and the NIDCD did not evaluate the headphones or fund the analysis, but did, along with other federal agencies, provide some expert background information. The Wirecutter staff paired headphones with a sixth generation iPod Touch. Each set of headphones was assessed for maximum levels of pink noise—which sounds similar to white noise, minus lower frequencies that are not associated with noise-induced hearing loss. Headphone loudness was also tested while playing two loud songs (“Cold Water” by Major Lazer and ZZ Top’s “Chartreuse”). Up to one-third of the headphones tested allowed volumes that exceeded 85 decibels. Almost half of the headphones exceeded this limit when tested with music. In addition, the testers found that they could bypass the volume reduction feature on many of the headphones. Only four of the headphones blocked background noise, but these headphones weren’t the best volume-limiters. You can learn more in the full report. These findings emphasize that although volume-reducing headphones might help to protect children’s ears, parents should still supervise their use and encourage children to keep the volume at a safe level. NIDCD Director James F. Battey, Jr., M.D., Ph.D., provides a good rule of thumb: “If a parent is an arm’s length away, a child wearing headphones should still be able to hear when asked a question,” he said in a related article published December 6, 2016, in the New York Times. If your child doesn’t pass this test, he or should take a break from the music and turn the volume down when listening starts again. Tips for protecting children’s hearing when listening to musical devices can be found on the Noisy Planet website.